Every day before earnings, we run this chart. We have used Apple's previous 11 quarters of earnings reports to determine the difference between its guidance, and its actual results to get an idea about what it might really report. Now, before you take these numbers and run, beware! Apple for the longest time destroyed its guidance. In the last two quarters it merely beat its guidance. So, there's a good chance Apple's actual results are below our projections. Apple reports earnings tomorrow after the market closes. It's going to be great. So, tune in here. Top Line Expectations Apple management forecast $34.00 billion in total revenues, the analysts expected $35.80 billion, and the result was $35.97 billion. A small beat. That's a +2.69% QoQ increase and a +27.22% YoY increase. What about next quarter QE December 2012? Apple's outlook is $52.00 billion, a +44.58% increase QoQ and +12.23% YoY. Apple traditionally sets the bar low on outlook, so a beat of $1.00+ billion on their own outlook is probable . 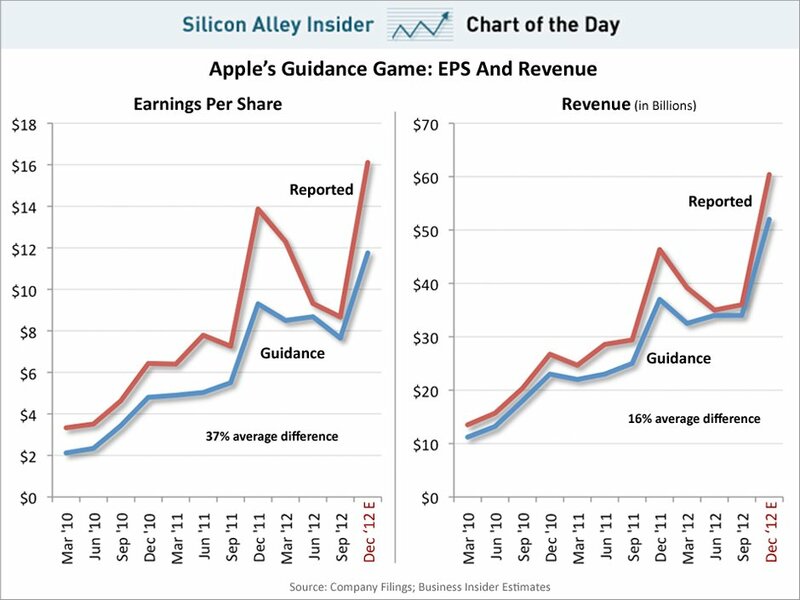 The Holiday Quarter, the QE December 2012, is the Big Quarter for Apple on an annual cyclical basis. The prior year QE December 2011 total revenues were $46.33 billion, an Apple and technology sector all-time record high. Bottom Line Expectations Apple management forecast $7.65 earnings per share, the analysts expected $8.75, and the result was $8.67. A small miss. That's a -6.97% QoQ decrease and a +22.98% YoY increase. What about next quarter QE December 2012? Apple's outlook is $11.75, a +35.52% increase QoQ but a -15.28% decrease YoY. A decrease next quarter for EPS YoY would be the first such occurrence in years. Apple traditionally sets the bar low on outlook, so a big beat of their own outlook is necessary to maintain the long-term uptrend. The prior year QE December 2011 EPS was $13.87, an Apple all-time record high. Annual Trends The annual trends for total revenues and earnings per share are below. Is the top in and growth slowing for Apple on a year over year basis? Most likely. Next quarter, the QE December 2012 Holiday Quarter will begin to tell the tale as the annual cyclical peak is reached. Margins The concern and uncertainty are decreasing margins. Gross margin (40.04%) is solid, but a 7-quarter low. Operating margin (30.43%) correspondingly decreased to a 7-quarter low. Hence net margin (22.86%) also slumped, to a 6-quarter low. The margins have been remarkable, but peaked at the QE March 2012. The 15-quarter averages are 41.20%, 30.74%, and 23.01%, respectively. So current margins are near historical averages. Quarterly Regional Sales Trends Apple's primary driver of revenues continues to be the Americas, specifically the USA. Asia-Pacific sales, notably China, have slumped for 2 quarters and are now below Europe, which is surprising. This is even as Europe sales performance is lackluster. Earlier this year, most were convinced when Asia-Pacific sales surpassed Europe it was forever. Both Retail and Japan sales posted moderate gains. Quarterly Product Sales Trends iPad sales decreased -$1.66 billion while Mac computers sales increased +$1.68 billion, offsetting each other. Likewise, iPod sales decreased -$240 million while Music Products & Services increased +$280 million, basically offsetting each other. That leaves an iPhone sales increase of +880 million to essentially increase overall revenues by $943 million for the quarter. Financial Position Total assets surged to another all-time and tech sector high of $176.06 billion. Apple's market capitalization has been #1 worldwide. Cash and marketable securities are $29+ billion. Add long-term marketable securities and the liquid reserves are $121+ billion! Disclosure: I have a beneficial interest in a long position in AAPL stock. Are Apple's High Growth Days Over?